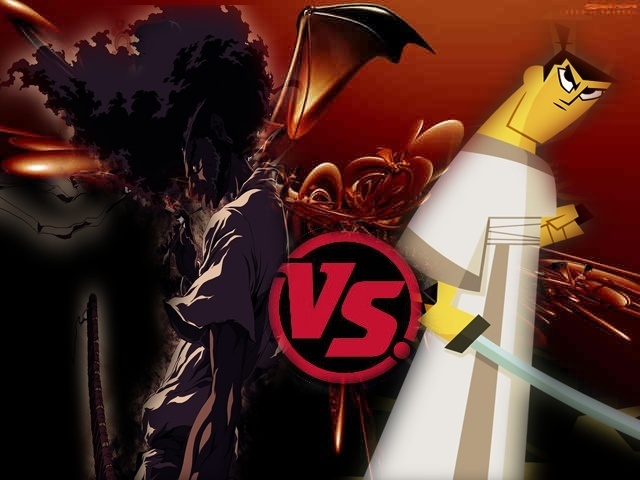 If Samurai Jack and Afro Samurai faced off who would win? Lol I have no idea who Afro dude is. The series is set in a "futuristic, yet feudal Japan," and stars a samurai named Afro for his hair. The story follows Afro as he tries to avenge his father's murder.In the world of Afro Samurai, it is said that the one who becomes "Number One" will rule the world, wielding powers akin to a god. Someone becomes Number One by killing the previous Number One and taking his ceremonial headband. However, the only rule in this world is that only the "Number Two" (also designated by a sacred headband) is allowed to fight the "Number One." The downside of this is that anyone (and typically everyone) can challenge and try to kill the Number Two, to gain the right to move forward and challenge Number One. Afro Samurai's father was the old Number One, until he was challenged by a gunman named "Justice" (who was then Number Two), who fought him in a duel to become the new Number One. At the time Justice challenged his father, Afro had only been a child. Justice severed his father's head right in front of the young Afro. Now an adult, Afro Samurai is the current Number Two and a master swordsman; he travels the road seeking revenge on Justice, the current Number One. Lengthy flashbacks interspersed throughout the story detail how Afro rose from frightened boy fleeing the death of his father, to master swordsman, and eventually to become the current "Number Two", while the story in the present deals with the adult Afro making his way to the mountain top keep of the "Number One" to duel Justice, while at the same time the mysterious cult known as the "Empty Seven Clan" sends various agents to kill Afro and take his Number Two headband. I think that Jack might win. yes he is a samurai, but if you watched the first episode he travled around the world learning various training methods, xoulin being one.